Use your DNA raw data from ancestry genetic testing service providers like 23andme, Ancestry DNA, Family Tree DNA (FTDNA), Living DNA, My Heritage can be used to know your variant status for these inherited conditions. * Your report may not contain all of the traits listed here depending upon the number of markers present in your raw data file. The maximum benefits from knowing your genetics will be visible when you start using the pointers by becoming physically active, eat balanced meals and get adequate sleep. Using the knowledge of your genetic makeup will help you make better food choices or understand why you have always preferred certain types of food. Xcode does not provide any direct medical advice to individuals and the reports are to be interpreted only by qualified medical/healthcare professionals. 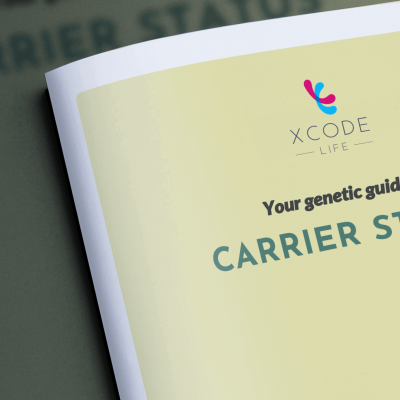 Xcode Life does not have direct affiliate connections with any ancestry genetic testing service providers like 23andMe, Ancestry DNA, Family Tree DNA etc. Genetic information must always be considered in conjunction with other information about your health like lifestyle, family history, biomedical data, nutrition, physical activity etc. Genetic information is subject to revision based on latest advances in scientific research. Genetic interpretations are based on the result of population studies and what applies to the whole population may not be true to an individual.